Genesis in Montreal or Quebec City? Inform me about the next events for Genesis. Enroll yourself to our priority waiting list for Genesis to be alerted when new tickets are available. Filling this form doesn't engage you to any purchase. Genesis, by far the best progressive rock music band, will be performing at the Olympic Stadium on September 14th. 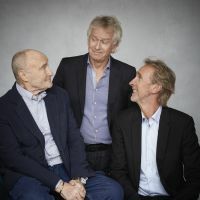 Phil Collins, Mike Rutherford and Tony Banks have unveiled the details of their North American tour via satellite last March 7th. Genesis hasn’t performed in North America in 15 years. Their last visit to Montreal dates back to May 29, 1992. The Turn Tour will be launched on June 11th in Helsinki, Finland.